Mallikarjun Bheemrayappa Mansur was born in Mansur, a village in the Dharwad district of Karnataka. As a child, he played a few roles in his brother’s drama company. Recognizing his talent, his father engaged him to a Yakshagana troupe, where he was encouraged to sing many different types of compositions. During his days in the drama company, Ayyappa Swami, a Carnatic musician noticed his talent and briefly trained him in that form. He was then noticed by Nilkanthabuwa Alurmath (a disciple of the legendary Balkrishnabuwa Ichalkaranjikar) of the Gwalior gharana, who took him to Miraj, and thus began his training in the Hindustani raag-sangeet. For 6 years he received intensive training from Neelkanthbuwa and emerged as a concert performer at the end of this period. He also recorded and released a few commercial records. In 1935, Mansur met Manji Khan, son and disciple of Alladiya Khan, who agreed to accept him as his disciple after listening to his record. Unfortunately Manji Khan died prematurely in 1937. Thereafter, he was directed by Alladiya Khan to his youngest son, Bhurji Khan and continued to train under him till Bhurji Khan died in 1960. Subsequently, he also learnt compositions from Bhurji Khan’s son, Azizuddin Khan. Although trained in both Gwalior and Jaipur gharanas, the virtuosity of the Jaipur gharana was more evident in his style. He could cast a hypnotic spell on his audience with his astounding breath control, the absolute purity of his Sur and the wonderful way in which he employed various embellishments. He was highly regarded for his Shruti-kaam. His constant weaving of the Sur with various permutations and combinations always remained in sync with the bhaav of the raga. Mallikarjunji was widely known for his command over a large number of rare ragas like Sampoorna Malkauns, Shuddha Nat, Asa Jogiya, Hem Nat, Khat, Shivmat Bhairav, Bihari, Nayaki Kanada, Bahaduri Todi, Adamabri Kedar, etc. Sangeet Natak Akademi Fellowship, 1982. He wrote his autobiography ‘Nanna Rasayatre’ in Kannada. 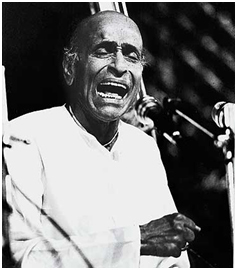 It was later translated to English by his son Rajshekhar Mansur under the name ‘My Journey in Music’. In 2013, a five audio CD collection, ‘Akashvani Sangeet’ of his music including rare ‘Vachana Gayana’ renditions, was released by All India Radio archives. He also worked as a music director for HMV. He composed music for films ‘Subhadra’ and ‘Chandrahas’. He worked as the Head of the Department of Music at the Karnataka University. He worked in theatre troupes namely Vani-Vilas Natak Mandali and ‘ishwagunadarsh Company. Many of his commercial records have been released by HMV and Music Today.